A fishing license is required to crab in all waters of the State of Delaware. The blue crab is common in all the tidal waters of Delaware. It is a popular recreational resource and tops the list of the State’s economically important marine fish and shellfish. Blue crabs grow very quickly and reach maturity in 12 to 18 months. Most do not live beyond two years under current exploitation levels. In order to grow, a blue crab must shed its shell and form a new shell. This process is repeated up to 18 times to attain maximum length. It is legal to take crabs at three stages, but to get the most yield in weight out of a crab, they should reach a minimum length before being harvested. This is measured from point to point of the top shell. The minimum size for hard-shell blue crab is 5 inches, except mature females. Mature females (sooks) are identified by the rounded apron on their under side. Once this stage of development is achieved, females stop growing. Therefore, female blue crabs with a U-shaped apron may be retained at any size. Females bearing eggs, commonly known as sponge crabs, may not be taken and should be returned to the water immediately. Recreational crabbers may not use, place, set or tend more than two pots. The person claiming to own the pots must be the one to set and tend them. These pots must be marked with all white buoys with the owner’s full name and permanent mailing address inscribed either on the buoy or on a waterproof tag attached to the buoy. All crab pots must be tended at least once every 72 hours. All crab pots must be removed from the water between December 1 and February 28. Recreational crabbers may use a trot line (no length limit) and any number of hand lines or traps. The recreational daily limit is one bushel per person. 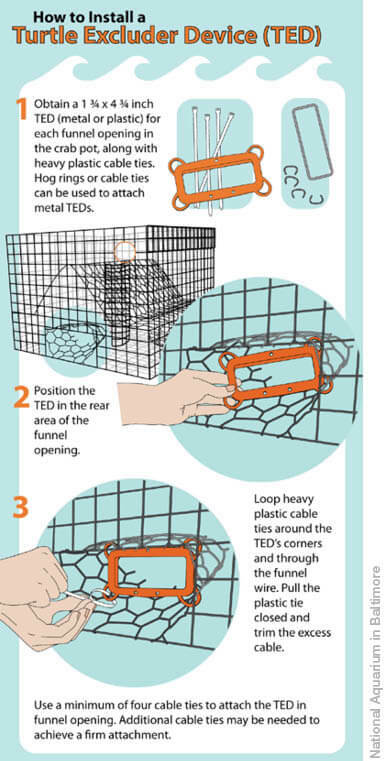 A turtle by-catch reduction device is required to be attached in each funnel entrance of a recreational crab pot to reduce the possibility of diamondback terrapins entering and drowning. A by-catch reduction device is a rigid rectangular frame of plastic or metal that measures 1.75 inches x 4.75 inches and is available at local tackle shops, or can be hand-made from heavy (>11 gauge) wire or other suitable material. A fishing license is required to harvest clams in waters of the State of Delaware. See Fishing License Information for details. It is unlawful for any person to attempt to take, catch, kill or reduce to possession any hard clams with a device other than a hand-held rake with a head no wider than fourteen (14) inches measured perpendicular to the tines and a straight handle not in excess of seven (7) feet in length. 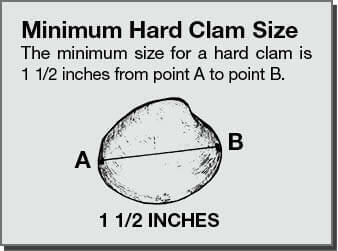 It is unlawful to harvest hard clams from one-half hour after sunset through one-half hour before sunrise. It is unlawful for any resident to harvest more than one hundred (100) clams per day unless otherwise permitted to do so by license or permit. It is unlawful for any non-resident to harvest more than fifty (50) hard clams per day unless otherwise permitted to do so by license or permit. No shellfish harvesting (excluding crabs) is allowed in the Prohibited Areas marked on the map on Fishing & Clamming Maps or any tidal river, stream, or impoundment of the state. This includes all non-tidal and impounded water as well. Shellfish harvesting is allowed from December 1 through April 15 in the Seasonally Approved Areas. This is your protection against contracting shellfish-borne diseases. This is also the law. All boundaries may be marked with signs and or buoys saying “No Shellfish Harvesting” or “Prohibited Shellfish Area.” Questions regarding these closures should be directed to the Watershed Assessment Section Shellfish and Recreational Waters Programs 302-739-9939. Clamming is prohibited in eel grass beds marked with white PVC pipes and signs. It is unlawful to recreationally harvest oysters in Delaware. This prohibition protects vulnerable oyster populations and protects you against contracting a shellfish-borne disease. 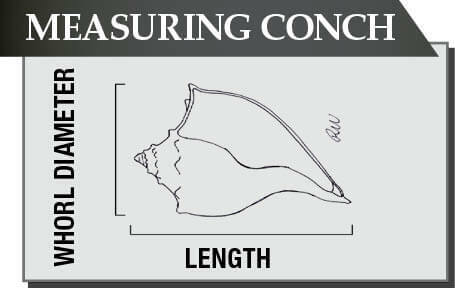 Conch (channeled and knobbed whelk) may only be taken using conch pots with at least one escape vent measuring at least 5 inches x 10 inches in the top or parlor section. The recreational harvest of conch by any other method is prohibited. Recreational conch potters may not use, place, set or tend more than two conch pots. The person claiming to own the pots must be the one to set and tend them. These pots must be marked with all white buoys with the owner’s full name and permanent mailing address inscribed either on the buoy or on a waterproof tag attached to the buoy. All conch pots must be tended at least once every 72 hours. Knobbed conch must measure at least 5 inches along the axis or have a minimum diameter at the whorl of 3.0 inches. Channeled whelk must measure at least 6 inches along the axis or have a minimum diameter at the whorl of 3.125 (3 1⁄8) inches.